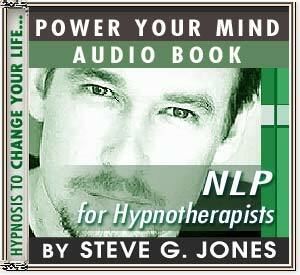 If you already understand hypnosis and want to add the power of NLP to your sessions, this audio book on CD is for you! Imagine having the power of Neuro Linguistic Programming behind you as you work with hypnosis clients. Even if you have no training in NLP, you can achieve amazing results after listening to this easy-to-understand guide to combining NLP and hypnosis! NLP (Neuro Linguistic Programming) has its roots in Pavlovian behavior modification. You remember Pavlov…the Russian scientist who, in about the year 1900, made the dogs salivate by ringing the bell. He would start by ringing a bell while letting dogs smell meat powder. Eventually, he only needed to ring a bell. This alone caused the dogs to salivate. Later, A scientist named Watson came along and applied Pavlov's techniques to humans. Then BF Skinner, a student of Watson's, refined these techniques and made them highly usable and well-known. In about 1975, Richard Bandler co-founded Neuro Linguistic Programming. He added numerous variations to what is now a 100-year-old science. Bandler and his associates came up with all sorts of useful applications for behaviorism under the new name of NLP. In the 1980s, Tony Robbins took this same information, added a little seasoning, shook it really well, and out came Neuro Associative Conditioning. All of these things are essentially the same and operate on the same basic principles. Thanks to the vast body of knowledge we now have, it is possible to apply it to almost any problem. Smoking, overeating, nail biting, fear of public speaking…all of these things are treatable with NLP. My book takes all these techniques, adds a few of my own, and shows you how to weave them all together with hypnosis. Let's take a look at a powerful NLP technique you can use right now. I teach this one to established actors who need a little boost between multi-million dollar movies. Yes, even established actors feel a little self-conscious sometimes. NLP stands for Neurolinguistic Programming. NLP is a type of interpersonal communication model. In NLP, things are represented either visually, auditory, and kinesthetically. NLP was created in the mid-1970’s by Richard Bandler and John Grinder. There are many different NLP techniques including rapport. Rapport building is a great use of NLP. When you develop rapport with someone using NLP, you are in a way mimicking them, but so that they don’t pick up on it. There are several techniques used in order to establish rapport. Those techniques include pacing and leading. If you find NLP to be fascinating and you want to learn more, I encourage you to do so. I have an audio book called “NLP for Hypnotherapists” which is very informative. I also have done several videos that I have posted on You Tube. The videos on NLP are fun, informative, and free!! Here's how it works…think of three times in your life when you felt very powerful and in control. Write them down (one sentence describing each). Now stand alone in a room. Think of the first situation. Recall it in full color with sound and anything else that could make it real to you. At the moment when you feel fully back in that moment, slap your left shoulder with your right hand and say, "Power!" Do this with each of the three memories. Remember, you want to anchor the feelings by slapping your shoulder when you feel the memory at its most intense moment. In NLP, this process is called stacking anchors. Now that you have the anchor installed, you can fire it off as needed. The next time you are in a situation requiring confidence, slap your left shoulder with your right hand and say, "Power!" Just as sure as Pavlov's dogs salivated when they heard that bell, you will feel confidence surging through you! In the book, available in CD or MP3 format, I cover this technique more thoroughly as well as numerous others.